When squally storms turn violently electric, we all know that lightning follows – and sometimes that flash from the sky can strike where we would least suspect. 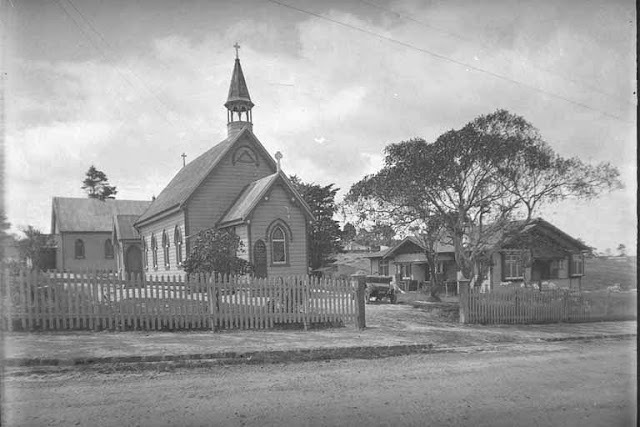 On the Saturday afternoon of 18 June 1932 – that place was Avondale’s St Jude’s Church. In the midst of a particularly heavy thunderstorm in the western districts, where, according to a news report at the time, “several flashes of lightning of more than usual vividness were seen”, one bolt struck the cross atop the church steeple. The force snapped off one arm of the cross, before it surged down the roof, tearing the iron sheathing, then entering the church’s electrical system, then flowing across to the telephone line at the adjacent vicarage. Reverend Arthur Volkner Grace and his wife Agnes had only started their time at Avondale that same year. They were at home on the day of the storm, probably preparing for the Sunday services, when the cap of their phone’s insulator was suddenly blown off, startling the couple. What damage was done appears to have been soon repaired by the parishioners. Rev Grace later retired to Mairangi Bay in 1936.